As Somerville seeks to move up the ranks as the most bikeable City, they are also making sure everyone knows where they're allowed and not allowed to pedal. Speed and close-calls with pedestrians in bustling Somerville squares is proving to be a dangerous combination and City Officials are putting steps in place to keep everyone safe, including the decals in the picture on the left, increased enforcement of cyclists in the squares and on the streets has already been implemented. The Patch recently reported on a story of a cyclist arrested for not cooperating with Police after running a red light. This comes on the heels of a sting operation for pedestrian safety that grew much attention on the local media scene (Times, News Weekly, My Fox Boston). 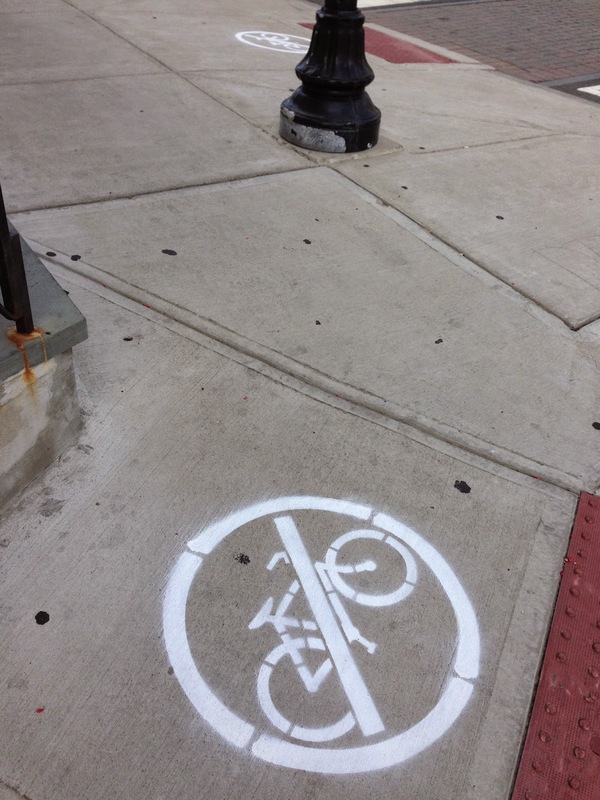 Decals have been painted on sidewalks in the Magoun Square area are alerting cyclists that they are not allowed on sidewalks in the increasingly busy business district. 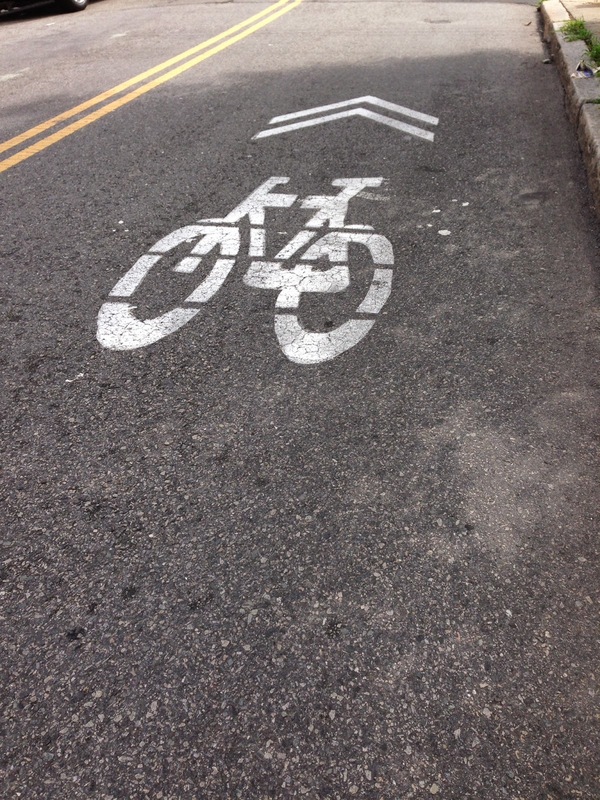 With the mileage amount of bike lanes and sharrows being painted around Somerville constantly increasing, it is clear that the City wants cyclists off sidewalks completely. I would like to see more cyclists given tickets for there lack of driving ability. They don't use turn signals, they run red lights and they seem to want to be a pedestrian, bicycle and car all at the same time. I love the decals and would like to see more enforcement in the Squares. Good job!! It's about time somebody did something about cyclists in the squares. Who do I write my 'thank you' card to? As a daily cyclist I would agree that many run reds and don't use signals, however the same can be said for automobiles along with hanging rights around cyclists, texting while driving and parking in bike lanes. As a whole there needs to be more enforcement on the roads for everyone's safety. Slam everyone with tickets and we can afford more of those pretty trees. About parked vehicles in bike lanes. Far too many streets in Somervile where bike lanes, allowed parking, and motor vehicle travel lanes, are one and the same. As for hanging rights around cyclists. So long as a driver,intending to make a legal right turn, gives ample notice of that turn by activating his/her right turn signal it's up to the cyclist to observe that signal,slow down or even stop, to allow that turn to be made. Most vehicles right side view mirror do not give a driver a true distance of any traffic, be it a bicycle or a motor vehicle, coming up on his/her right side. It's up to the cyclist to use common sense to avoid an accident in such a mortor vehicle right turn scenario as described above. I have seen bicyclists coming down my street, hands of their handle bars and texting. How stupid!! Yes, vehicle drivers too! Sounds good. Criticism of cyclists behavior is totally valid, but only if it is accompanied by equal criticism of the lack of a complete streets approach to street design. A few days ago while cycling, I missed getting doored AGAIN by about 2 incheds. It was my 4th or 5th near miss this year. Or another way to put it, 4 or 5 times this year, I was inches away from having my femur broken and then thrown out into oncoming traffic. The people who complain about how dangerous cyclists are, have no idea how dangerous just going in a straight line down the street is. 2 ton vehicles blazing past your left shoulder by about 18 inches. Constant random gashes in the pavement that are 2-3 times deeper than your tire underneath you. And parked cars that could shoot a door out at you with no notice all along your right side the whole time. Not whining, that's what city riding is all about. But it's really easy to tell by peoples opinions around biking who has no experience from the other side of the equation. I would offer the opinion that a great number of cyclists also own and drive motor vehicles; and are guilty of the very same bad vehicle driving habits that they complain about when cycling. As for drivers blowing through red lights. For drivers it's a rare exception for violating a red light; but a common violation committed by cyclists. Same goes for one-way street violations by cyclists. I see automobile drivers do illegal/stupid things all the time. I see bicyclists do illegal/stupid things all the time. I see pedestrians do illegal/stupid things all the time. There are jerks/idiots out there, and happy when there is enforcement for all 3 modes of transportation. Bicyclists are, however, in the unfortunate situation of frequently not having properly designed infrastructure. The roads are well built for autos, and the sidewalks are well built for pedestrians, but bike infrastructure continues to be an afterthought that is very slowly starting to make some progress. We can add cyclists (and drivers) not stopping at crosswalks when such crosswalks are occupied by pedistrians. Some scenarios exist where a pedistrian will step into a crosswalk at the last possible second, and a driver or cyclist has allready committed to not stopping. Not fair for a motorist or cyclist to be cited in that case. They can do just about anything wrong, and unless there is a policeman there to pull the cyclist over, no way can that cyclist be identified; as with a registration plate on a vehicle. Years ago, at least in Somerville, every bicycle had to be registered at the police department, and a registrstion plate issued that had to be attached to a rear fender; readily visible; about 6 inches long and 3 inches wide. Bicycles these days come with no rear fender. But Somerville still wants all bikes registered in case stolen. The registration ID on the bike not essily seen for violation reporting. If it's any consolation for a bicylist suffering injury or bicycle damage because of a car door being opened; the law says the person opening the door is automatically at fault, and is subject to a $100.00 fine.